"Let me make this clear: Bush41 was a one-term president. I'm going to be a two-term president. Even if the bitter clingers kick me out, I won't be a failure like Bush41. After all, he was father to Bush43, so that proves he was a failure, unlike me." Note too in this crisis, the silence of Geo. and Geo. W. Try to imagine The One as ex-Prez showing so much deference. Final thought: The One piously warbled that he'd a really good one-term prez instead of a mediocre two-termer. Well. There's Lincoln, and then to drop some, Polk. After that? J. Adams, J.Q Adams, Van Buren. Tyler, Taylor/Fillmore, Pierce, Buchanan, A. Johnson, Hayes. Garfield/Arthur, Harrison, Taft, Harding, Coolidge Hoover, Kennedy, L. Johnson, Jimmy Bumpkin, and Bush41. Which two categories does "Obama" fit, easily and naturally? In a spirit of bipartisanship, I will allow that I would not begrudge Obama time off on Sunday for Kentucky versus North Carolina. I was named for my grandfather Walker, G.H. Walker. I was "G.H. Walker Bush." His sons and daughter called him "Pop." So then I came along, I was Little Pop — "Poppy." And so I was called "Poppy" all my life. I knew I hadn't hallucinated that nickname! And who was the secretary of Defense at the time? Why, the great evil one himself: Richard B. Cheney! Take any week of GHW Bush or Baker's career in the 10 years prior to the first Gulf War. In that week they had more relevant experience in international affairs than Obama or Hillary have had in their lifetimes. Now take a spec of dandruff off of GHW's head. There is more decency, integrity, humility, appreciation for America and love for the American people than in the entire Obama gene pool. How could anyone compare Obama to GHW Bush? It is preposterous and unfair. Like comparing me to LeBron in basketball. Outstanding read... I had forgotten how effect Bush was. The difference between a leader and a zero. guydreaux: You are obviously a racist person. Dandruff is white and you obviously are bringing out GHW Bush's whiteness aren't you? That's just so darn racist. You had a better idea comparing obama to lebron. Obama would win because when it comes to basketball he is just so cerebral, so darn good looking, such beautiful pec's that lebron just can't compete. And of course Obama is a social worker so he cares more about the people. Your biggest mistake was comparing Obama to other presidents. Even Jimmy Carter wins by a mile. It appears to me that Obama has placed us in a position that is much more fiscally responsible than jumping to the front of the line and claiming this war as ours. Let the EU take an active role. I'm fine with that - much more comfortable than yet again being the country who has to shoulder the entire burden. I would rather use some of our money to educate our children than to continue to pour gigantic dollars into another nebulous project with no clear end. Andrew (#8), my excellent friend: Thanks for your comment! So let's see, re "defining the mission and the enemy": You think it's much easier for the world to pick out the bad guy if he's invading a neighbor, as opposed to merely using anti-aircraft guns and other heavy weapons on his own civilian populace. We agree, apparently, that oil-rich countries have increased strategic importance for the U.S. and the world, especially when they're being held by a ruthless dictator who's shown a keen interest in WMDs and has a long history of using oil wealth to foster international terrorism that's killed hundreds of Americans over decades — so both the Kuwait/Iraq situation and the Libyan situation actually have that in common. You've obviously forgotten the damage done to Bush-41 at the ballot box in Nov. 1992 from the regular, inevitable contraction in the business cycle and resulting recession that had peaked several months before. Because of that recession, Bush-41 went from being so presumptively invulnerable during the primary season that none of the top Democrats would throw their hat into the ring, to being beaten by the governor of a small, comparatively backward state who hadn't even been able to win consecutive terms as governor. You're certainly right, however, that that recession — while enough, with defections to Perot, to cause Bush-41 to lose to Clinton — wasn't remotely as grave as the multi-trillion deficits Obama has rung up in his first two years and guaranteed for years to come. Along with a growing majority of Americans, I tend to view that as a bug, not a feature — and certainly not something which excuses Obama's incompetence in foreign affairs. You've also forgotten that with the exception of the brief American interventions in Grenada and Lebanon (with very mixed results) under Reagan, we had no recent military experience: the entire American military in 1990-1991 was still suffering from the lingering doubts that since Vietnam, we were a paper tiger, as evidenced by the wreckage of our helicopters at a site called "Desert One" somewhere in Iran. The troops Bush-41 had to deploy to Saudi Arabia came from bases in Europe with their tanks still painted in the forest camouflage appropriate to facing Soviet tanks across the Fulda Gap. They turned out to be damned good even though they'd never fired a shot in anger before, but nobody knew for sure that's how it would turn out. All the Dems who voted against Desert Storm — including, prominently, our current VPOTUS — predicted it would be "another Vietnam," and that vote was much, much closer than either of the Congressional votes authorizing Bush-43 to use force in Afghanistan and Iraq. Obama, by contrast, inherited a superb, confident American military that had so convincingly trounced Saddam's army in 2003 that this self-same Kadafi we're dealing with now voluntarily gave up his WMD program as soon as Dubya looked at Kadafi cross-wise. I'm still waiting for you or any other Democrat I know to acknowledge just how much worse things would be in Libya today if not for George W. Bush's resolve to overthrow Saddam and its immediate resulting effect on Kadafi back then. Yes, since 9/11/01 our military has been continuously tested, stretched, honed, and refined. But don't insult our soldiers and sailors and airmen and Marines by suggesting that they're in any way the weak link here: They have done, and will do, every mission Obama gives them magnificently, and even though they they follow the POTUS' orders even when the POTUS is obviously being a dolt, they certainly aren't to blame for his shortcomings. No, sir, it wasn't a lack of capable,battle-tested, and battle-ready aircraft carrier groups, but rather direct orders from Pres. Barack Obama, that kept our carrier groups out of the Med for, literally, weeks while Kadafi proceeded to consolidate his position and re-take ground won by rebel forces. The weak link here is at 1600 Pennsylvania, not at the Pentagon. That the muddled political and diplomatic efforts of the Administration haven't yet visibly impaired our actual war-fighting ability much is a tribute to our troops' professionalism, but one must wonder how much more effective they'd be with a clear, unconflicted mission. And thank you for one very thorough belly laugh: The only "exit strategy" Obama has is punting to someone else — and there's no one there! NATO is us, we're its senior and majority partner. American planes and ships are going to continue doing all the combat — while other countries enforce a no-fly zone only against Libyan planes that aren't flying anyway, and a sea embargo only against a Libyan navy that won't come out of port. Bush-43 had a coalition containing twice as many countries for even the Iraq War in 2003, and many of them put their soldiers in harm's way with ours and suffered casualties as a result. If this isn't "our war," whose is it? If that's true, shouldn't you be condemning Obama outright for waging it? We've seen how well things went in, say, the Balkins in the 1990s when we left "the E.U." to "handle things," and instead saw them effectively facilitate the Serbs' massive "ethnic cleansing" of Muslims. And of course, the Europeans didn't do such a great job on their own in 1914 and 1939, either — so why should we defer to them now? In the real world, the E.U. is about as effectual and coherent as a wet noodle. The E.U. can't even prevent civil strife threatening a national breakup in Belgium, Andrew, which hosts the E.U. government! The strongest economic power in Europe, the Germans, are already back-pedaling away from Obama's coalition as fast as they can. So your reason for believing that the E.U. will, or even that they can, handle Libya capably if only we'll just let them is ... what, exactly? To believe that, one has to live in a fantasy world which doesn't include any of the history of the 20th Century. Finally, you can't possibly still be deceived into thinking that the problems with American education are the result of inadequate money flowing into the system. Over the past decades we've doubled and doubled again what we pay into that system at the state and, increasingly (and increasingly wrongly) federal, levels — yet public education gets worse and worse, with more and more administrators and more union stupidity and more bloat. This is one of the most wicked Democratic memes because it continues to hurt — by misdirection of attention from what's to genuinely blame — our children in the public school systems. And what makes you think Obama is getting anyone else to pay for the costs of our warships and planes that are actually going into harms way, expending ordinance, etc.? 'Cause he hasn't gotten that agreement, nor anything remotely close to it. So presenting this as a fiscal triumph of the Obama Administration is a particularly bad way to try to change the subject. We'll do better to continue this conversation at lunch next week, but I did want to point out a couple of important thought I had when reading your reply. Saddam. But that's all aside the point. It is much simpler situation to say "our job is to make this madman get out of a country that he's wrongfully invaded and as soon as we do we are done" than to get support for stopping someone from doing bad things to his own people. It is the essence of the difference between what Bush 41 did (which had a clear goal and a clear end) and what Dubya got us into in which we are still mired. 2. Never, not once, ever, have you heard me say or seen me write anything that suggested less than full support for our military men and women. There isn't a better fighting force in the world. I did not mean to suggest that there was any military reason for Obama's decision not to take the lead in the Libyan situation. My comment about fighting two wars was not an attempt to subtly suggest that our military wasn't competent to take on this task - they will do exactly what they are ordered to do - but rather to note that we have jumped into these situations quickly in the past and it's easier to get in than out. 3. Finally - is it seriously your contention that the problem with public education is the children? What then is the solution? We live in a resource limited world. The amount of money that we spend reflects our priorities. We should be spending money on education. It's not a sin and it's not a misdirection of our national priorities and saying that we should spend money on it isn't "wicked." To be continued next week at Barnaby's I hope. (1) Most of my comment was designed to rebut your assertion that things were easier for Bush-41. Our military wasn't busy elsewhere, but it was completely untested. The economy was tough then too. The excuses you were making for Obama just aren't persuasive. And as far as the military situation, Libya is a country whose population and infrastructure are all concentrated along the coast, where it's completely subject to continuous patrol by American ships and naval aviation; we can project our military power there much more easily, cheaply, and continuously, than in Iraq, or than in land-locked Afghanistan. Of course, Libya's military has only a fraction of the capabilities that Saddam's had in either 1990-1991 or 2003. We've been recognizing American interests in Libya since Jefferson was president, and the first line of the Marines Hymn refers to the same "shores of Tripoli" that we're talking about now. So I stand by my original point: I agree that the situations aren't entirely comparable, but to the extent they're not, Bush-41 faced much larger and more difficult challenges, and yet in six days managed to do what Obama hasn't done in six weeks. Re targeting Kadafi, I'm glad we agree on that. Recall that regime change in Iraq, however, was no part of the expressed goal of Desert Storm and Desert Shield; rather, its goal, as Bush-41 made clear from the first day until the last, was to force Iraq's withdrawal from Kuwait. Even so, Bush-41 didn't ever rule out the possibility that we'd encourage Iraq's withdrawal by taking out Saddam, and we flew combat missions designed to decapitate his regime's command and control (which included, potentially, him); I'm sure you remember the Amiriyah shelter bombing, in which our smart bomb which hit exactly the bunker it was intended to hit, but that bunker turned out to be a night-time air raid shelter in addition to a day-time command center, with tragic results. Bush-43, by contrast, had a statutory mandate passed by Congress in the Clinton years to support regime change, and we made no bones about targeting him and his sons by name then. So I hope you'll join me and the Brits in agreeing that it's stupid at best to rule out Kadafi as a target; and if you can think of any constituency that Obama's trying to court with that policy other than the folks at Code Pink or MoveOn.org, I'd be glad to hear it, because I think he's guilty of trading Libyan civilian lives, and potentially American warriors' lives, for hopes of maintaining Hard Left voter turnout. (2) I know you support our military, and that you're a patriot. I also know that many in your party (e.g., the Code Pink and MoveOn.org types) are not patriots, and that they have indeed rooted for the U.S. military to fail, and they've declared failure repeatedly already in Iraq and Afghanistan, and they will be equally eager to declare failure in Libya. But my specific point was to rebut what I thought was your suggestion that because we're involved in two mid-east wars already, that ought to excuse Obama from doing a competent job in Libya. It doesn't, and I gather that we now agree on that. And it's true but trite to say that it's "easier to get in than get out." We are in now, Andrew. 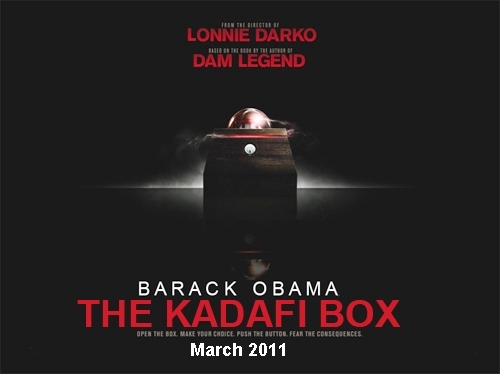 If we force out Kadafi but let Libya become a failed state like Somalia, the world will blame America for that. And completely apart from the humanitarian concerns, we cannot afford to just walk away — not when the country in question is sitting on oil wealth that would permit it to promote and sponsor world terrorism. So we're going to have to fix Libya — not because we're going to colonize it or exploit their oil resources without compensation, but because we've known since 9/11 that we can't permit countries like Libya to continue to do what Kadafi was doing before he gave up his WMD and cut back dramatically on his sponsorship of terror organizations. Libya has a different history and structure and culture than Iraq or Afghanistan, and poses some different challenges. Even if it ended up imposing costs in blood and treasure comparable to Iraq, though, it would be worth those costs to prevent it from becoming a terrorist haven and financier. Only a child can pretend that this job can be left undone, or that anyone else can do it. Unfortunately, I'm afraid that we have such a child in the White House. This is one of the most wicked Democratic memes because it continues to hurt — by misdirection of attention from what's to genuinely blame — our children in the public school systems. I thought it clear from the context that "what's genuinely to blame" were the administrators and union officials and other bloat whom I had just identified (in general terms) in the previous sentence. Claims that our schools are underfunded divert attention from these parasites who've been sucking up the tons of money, especially federal money, we've been throwing at education. It's our children who are continuing to be hurt as a result, because not enough of the existing money is going to things like genuine merit and recruitment bonuses that would actually break up and reform these monopolies of mediocrity, and pretending like the problem is inadequate funding will prevent the real problems from ever being addressed. I plead guilty to an ambiguous sentence, but you must plead guilty to not having tried very hard to make sense of it.